Friday January 20, 2017 Americans witnessed the handing of the baton off from President Barack Obama to President...Donald Trump. I didn't witness the inauguration. I did not what to see the beginning of this bleak new chapter in American history. I read the transcript of President Trump's speech and died a little bit more inside. My friend Anna had the idea weeks ago that friends should gather at her house, eat and drink, and "not watch" this changeover from a pretty great 8 years to its successor - a shadowy future. So Gerald and I packed up the kids and came over armed with wine, whiskey and appetizers. Other kids and parents showed up. All of the kids were slightly haywire with the late start - curfew comes early for the under-4 set. But we ate delicious spaghetti and meatballs, and drank wine and talked while our kids stampeded through Anna and Anthony's apartment in a blizzard of toys and laughter. I was too busy spending time with friends to take pictures but I do wish I had one shot of the happy mayhem that was wreaked by 10 children under the age of 4. My husband and I left Anna's house slightly tipsy with a full bellies and two overtired, happy kids. I also left feeling happier than I had when I arrived. I was filled with more hope than I have had since election night. Spending good time with good people makes me know that the fight isn't over. It has only just begun. Saturday dawned. I had the honor of watching the Women's March in New York City. 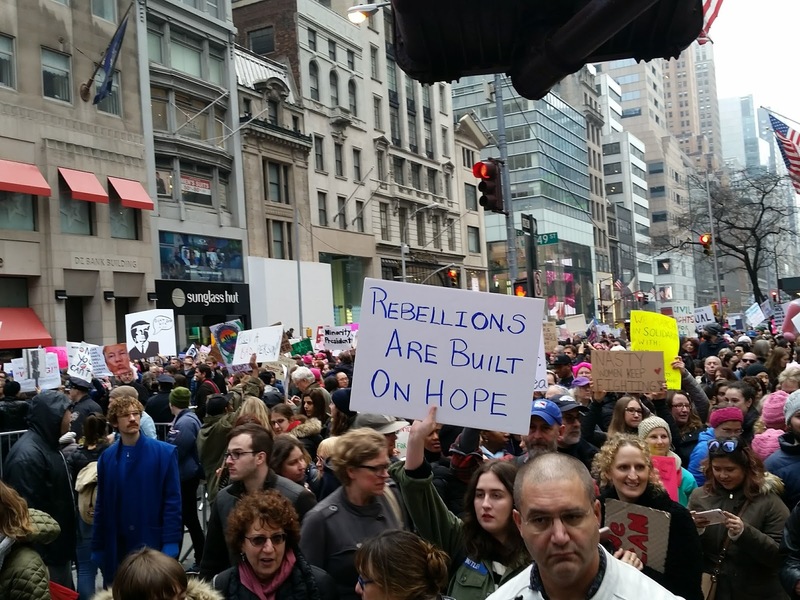 I watched as the first protesters came up Fifth Avenue and I cried - overwhelmed by the thousands of good people that have taken up the challenge to resist this presidency and to fight the myriad rights and freedoms that are soon to come under attack. I watched as the numbers swelled and over-ran the barricades - a wall of people from building to building marched down the avenue that is occupied by the most expensive retail stores in New York. A man standing beside me climbed up on a streetlight and said: This is what the Other 99% looks like." And he is right. "Who wants a picture of this? Who wants a picture of Democracy?" He offered to take the phones people passed up to him and photograph his bird's eye view. Many took him up on it. The sea of people was energized and positive and healing. I've heard it said that New Yorkers live in a bubble. We do. It is a rainbow bubble filled with everything and everyone you can imagine - we live on top of each other, and we bump elbows on the subway, and we witness millions of different dreams coming true or failing spectacularly every day. We do all this living together - regardless of and because of our myriad differences and similarities. Everybody should live in this bubble. Seriously. If you lived with a million - or even a few thousand - amazing, dynamic, and DIFFERENT people you're eyes might be opened up a little more. With the beginning of the Trump presidency I felt the bubble of my idealism pop. Maybe over the next 4 years we can build one big bubble that we can all live in.